2017 saw a continuation of last year’s series of Principal’s Dialogues for the year 6’s on the 25th of January at the School Auditorium. Mr Goh, Deputy Principal in charge of Academics, took the floor first to address an issue commonly termed “CAP Inflation”. What many students fear is the dilution of the NUS High Diploma’s value, amidst perceptions that modules are getting easier and that “compared to our alumni, graduates now have very high CAPs”. In response, Mr Goh highlighted the work that has gone into making the NUS High Diploma internationally accepted, and the checks and balances placed by NUS and MOE to maintain a rigorous curriculum. Mr Goh also reassured the students that “it is very important for us to get the CAP right” and to properly reflect the ability and talent of NUS High Graduates. This clear direction has set a clear path and ceiling for subsequent cohorts. Nevertheless, the academic curriculum of NUS High continues to evolve. Citing students’ concerns that rigorous honours modules would depress their CAP, Mr Goh revealed a plan to create a separate grading band for Honours Modules, which hopes to encourage students to push their academic limits. Another coming change is the option to take NUS modules in place of (instead of in addition to) Honours Modules. Mr Goh explained that NUS had to be careful not to double count credits, so that one module would not feed into the graduation requirements of both NUS High and NUS simultaneously. 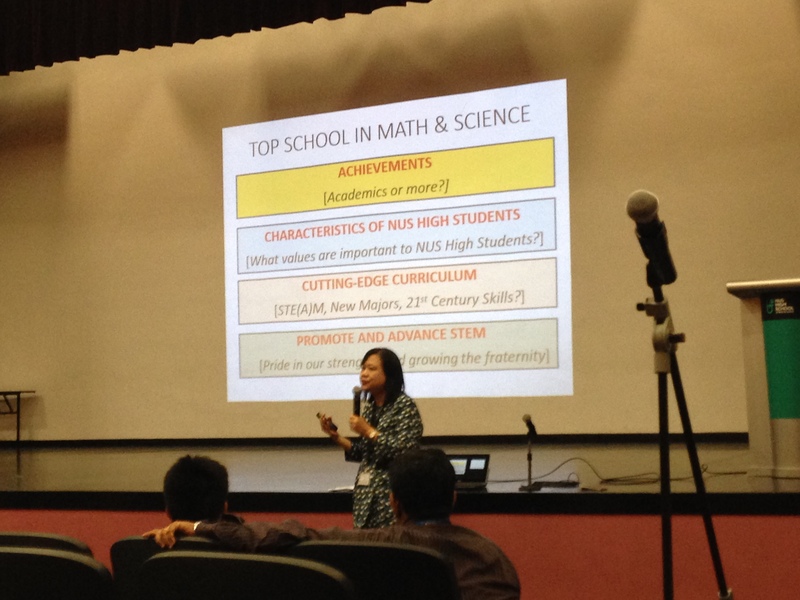 During the second half of the dialogue session, Mrs Lee talked about the upcoming Envisioning Exercise dialogue. She also outlined NUS High’s current strengths and asked students for their opinions on what changes they would like to see. The Envisioning Exercise is a 5-yearly process in which the school reviews its achievements and plans for the coming cycle. Mrs Lee emphasised the need to keep evolving, reminding students that, much like Nokia fell to the rise of smartphones, doing nothing wrong is not enough to succeed. Lastly, students were also invited to give speeches on behalf of their classes, regarding the concerns and visions of the students. There is a shared sentiment regarding the over-emphasis on the numerical CAP, and students agreed that the academic strength of the school was impressive. Still, they were keen to see the school branching out into other areas. In response, Mrs Lee encouraged students to talk to the principals directly should they have more ideas, concluding with pride that “what we offer in NUS High will continue to be relevant and well regarded”.